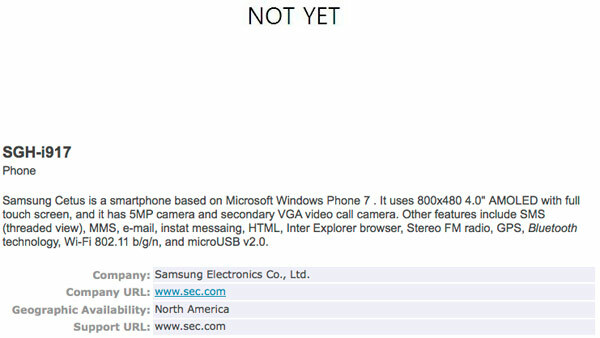 Samsung’s first entry into the world of Windows Phone 7 has been revealed via Bluetooth certification. Technically named the SGH-i917, Samsung has decided to call it Cetus, after the constellation/sea monster. In case you were wondering, it’s pronounced like Setus, not Ketus — unless you’re going back to the original Greek. Samsung Cetus is a smartphone based on Microsoft Windows Phone 7 . It uses 800×480 4.0″ AMOLED with full touch screen, and it has 5MP camera and secondary VGA video call camera. Other features include SMS (threaded view), MMS, e-mail, instat messaing, HTML, Inter Explorer browser, Stereo FM radio, GPS, Bluetooth technology, Wi-Fi 802.11 b/g/n, and microUSB v2.0. Four inch screen! Nice! Unfortunately, there aren’t any photos of it yet, but you can be assured that this is only the first of many devices from Samsung. “Cletus” would have been a superior name IMO.